Throughout the Republican National Convention in Cleveland this week, there was a persistent and obvious theme of discord on repeat. Call it “Music vs. Meaning” and let us sing some of its many verses: Musicians expressed resentment at Donald Trump and his party’s use of their songs. Acts — both on and off the arena floor — tried to send messages, with varied levels of success, about their political views. Intentionally or not, the possible future First Lady snuck a viral refrain from a 1987 pop song into a speech that was already problematic. The whole week was studded with such uncomfortable, perplexing and frankly odd moments. Quite a few bands whose music has been used along Donald Trump’s campaign trail have made their unhappiness very public: The O’Jays. The surviving members of Queen. George Harrison‘s estate. Adele. Earth, Wind & Fire. REM’s Michael Stipe. The Turtles. Aerosmith’s Steven Tyler (though he said his objection was financial, not ideological). Neil Young (though he, like Tyler, eventually said he was concerned about money and permission). And perhaps most famously now, The Rolling Stones — more on them later. But some of the most interesting intersections of — and muddlings between — music and politics this week came out of the Trump campaign itself. One of the highest-profile moments at the convention this week actually seemed to carry certain musical resonances, even if none were intended. After the sections of Melania Trump’s Tuesday evening speech that her husband’s campaign now says were taken from Michelle Obama came words that seemed to be a Rickroll: “He will never, ever give up. And, most importantly,” Mrs. Trump said, pausing just then to let her words fully sink in, “He will never, ever let you down.” Yesterday, CNBC reported that Rick Astley’s now-immortal 1987 hit “Never Gonna Give You Up” has enjoyed a 19 percent surge in Spotify streams since Tuesday night. Throughout his primary battles, Trump’s campaign soundtrack has included recorded tracks that expressly seemed to be aimed at simply amping up the audience, like Adele, The Beatles, and Survivor’s “Eye of the Tiger.” But Trump has also thrown in some curveballs that make it plain that at least somebody on that campaign has an ear for using music as theater. His playlist has often included a recording of Luciano Pavarotti singing the Puccinia aria “Nessun Dorma” (None Shall Sleep) from the opera Turandot. But in case that high-culture song is a bit too coded, the Republican candidate’s arrival in Cleveland on Wednesday was reportedly heralded by a recording of Jerry Goldsmith’s music for the 1997 flick Air Force One, starring Harrison Ford. 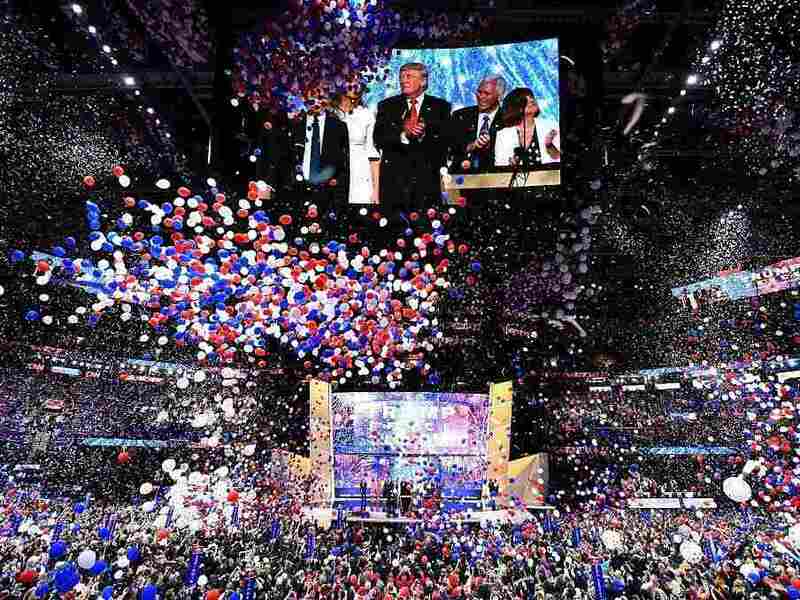 As the balloons and confetti (eventually) began to rain down last night at the Quicken Loans arena, however, rock ‘n’ roll had the last word on Trump — or maybe exactly the inverse happened. The evening’s last musical selection was the Rolling Stones’ “You Can’t Always Get What You Want.” Commenters on Twitter last night made hay of the seeming disconnects in meaning between the song and the convention’s spectacle of unity. But Trump has long used that tune in particular as one of his campaign’s anthems, despite the band’s fury and a request the band sent to the GOP candidate’s team earlier this year to stop using it. No one from the Trump campaign has explained exactly why “You Can’t Always Get What You Want” has become such a staple selection at his events — at one rally in Carmel, Ind. back in May, for example, the song was played at least four times at that single campaign stop. But in May, Trump himself responded to the Stones’ request in a way that appeared to slough off any implications of the song’s lyrics entirely: “I like Mick Jagger. I like their songs,” he told CNBC. Trump’s response to the Stones bulwarks Petrusich’s point. But it’s also true that there’s something of a bargain that artists — musicians, poets, painters, whatever — implicitly make when they put their work out into the world. They can create with whatever intention they want, but the receptors of that art — the public — are inevitably going to receive and interpret that output with their own filters, experiences and frameworks. There can be a big split between what is legally allowable and what makes artists happy. That is the deal. And once the creative work is public, others can assign whatever meaning they want to it— consciously or unconsciously, earnestly or cynically. And forever after, those works carry, in our communal memory, not just the artists’ intentions about that output (correctly understood or not), but also the resonances of how that music is later used by others. Even if Richard Wagner had not been an anti-Semite himself (which he certainly was), would most people be able to completely divorce his compositions from how they were loved by Hitler and the other Nazis? A less loaded Wagner example: Can anyone today hear his “Ride of the Valkyries” without instantly flashing to Apocalypse Now? Artists can make their displeasure widely known, of course; it’s easier today than it’s ever been, and absolutely instantaneous thanks to social media. But as soon as musicians feel the need to publicly disassociate themselves from their own work, they are that much farther away from their creations. There’s an intercessor, an interloper. After last night, will we ever be able to hear “You Can’t Always Get What You Want” again without feeling a slight tug of a certain memory — not of Mick Jagger singing, but of Donald Trump shouting? Next week, we’ll be looking at the intersection of music and politics at the Democratic National Convention, which begins Monday in Philadelphia.